I’m one of those people who loves mountain adventures. I feel at home there. Spending time in the mountains is my solution for solving all of life’s problems, and celebrating its victories! All that time in the mountains, has given me a certain confidence – even when mishaps occur. I’ve gotten lost – more than once. I’ve also sprained several ankles that resulted in veeerrry long hike outs! I’ve experienced a 20 C drop in temperature – 10 km into a hike! I’ve encountered lightening on top of a peak. I’ve ran into quite a few bears. But I know I have the skills to get myself out of most situations. The same confidence does not carry over for other terrains. I grew up in land-locked Alberta, near the Canadian Rocky Mountains. I kinda know what to do if I get caught in a rip tide in the ocean…but not really. Despite being a good skier, that did not translate into being good at sand-boarding in Namibia. In fact I was really awful! We all have our comfort zones. For many people the mountains lie far outside of theirs! If you didn’t grow up near mountains, or don’t live near the Alps, you may not feel confident about scrambling up a mountain! Hohe Tauern National Park is so beautiful that even laundry looks pretty! That’s why I love the concept of MoaAlm. It’s a holiday concept where adventures are shared and new friends are made. You will arrive as guests, but you’ll leave as friends is the promise on their website. After spending a couple of days with Barbara and Hubert, I can vouch that this is true! MoaAlm is one of two WearActive homes – a small company that offers ‘Relaxingly Active’ holidays in Hohe Taurern National Park, Austria and on the Croatian Island of Vis. It’s located at an elevation of 1800 m, where you usually only find mountain huts! You engage in activities tailored to you and to your adventure level. In summer, this includes hiking and mountain biking mainly, but rafting, canyoning, paragliding and rock climbing can also be arranged. In winter, guests can choose from downhill and cross-country skiing, snowshoeing, winter hiking and sledding. What I love most about the concept is the focus on community. Barbara or Hubert suggest suitable activities for guests and accompany them on all activities. They are a wealth of information on the flora and fauna in the region. We spotted an Alpine salamander at 1700m! This community focus gives you the chance to form real meaningful relationships with other guests through the activity, then again at the communal dining room table, where everyone revels in the adventures of the day! Me and Barbara hanging out after reaching our hiking destination in Hohe Tauern National Park! I find this travel concept attractive on so many levels. It’s especially valuable for strung out corporate types, who want the adventure, but don’t have the experience to go it alone, or the time to plan it! You can literally just show up at MoaAlm and they’ll take care of everything! It’s also great for solo travellers wanting to meet like-minded people. While you will experience adventure at MoaAlm, how much adventure is up to you. Hohe Tauern National Park is my favourite national park in Austria and also home to Krimml Waterfall, the highest in Austria. It’s high altitude results in breathtaking views without a huge uphill hike if that’s not your thing. I was recovering from a severed tendon in my ankle, so Barbara and Hubert chose hikes with less than 500 m of elevation gain during our stay. 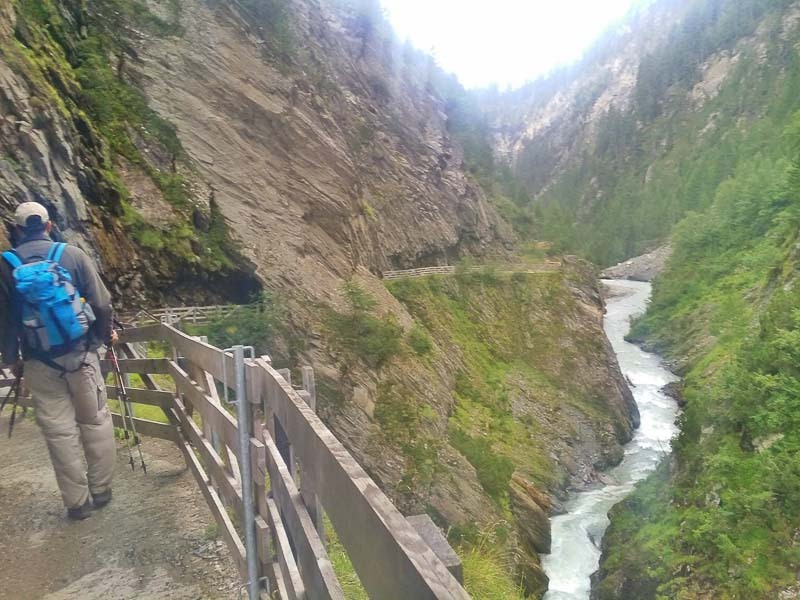 On our first day, we hiked straight from our doorstep to the incredible Dorfertal Valley. 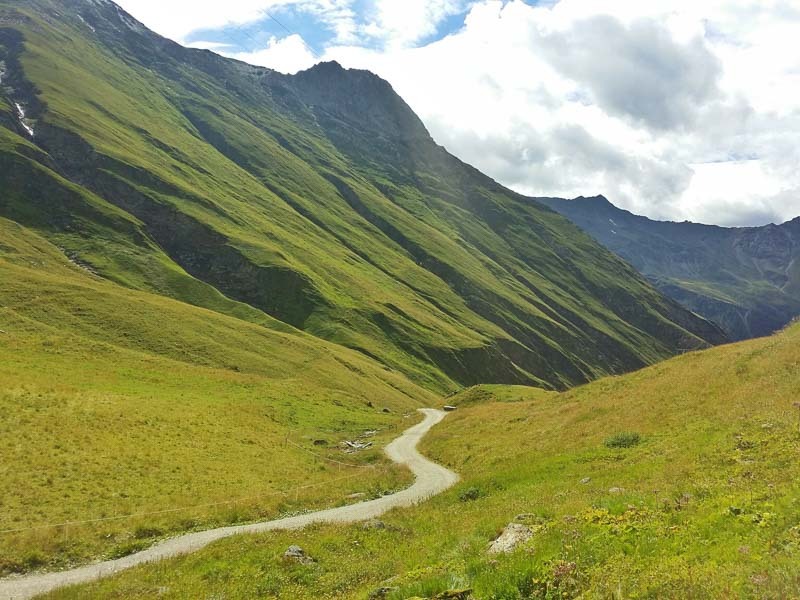 It’s one of the most important valleys in Hohe Tauern National Park with a long history of pastures! There’s something about seeing cows in the high alpine that always puts a smile on my face! Friendly cows in the Dorfertal Valley where we hiked. The next day, we drove a short distance, and did a hike leading to an alpine hut that would provide views of the Grossglockner, Austria’s highest peak! It partially revealed itself in between the cloud cover, but it seemed to taunt me, as if to say, You wanna see me? You gotta climb me! 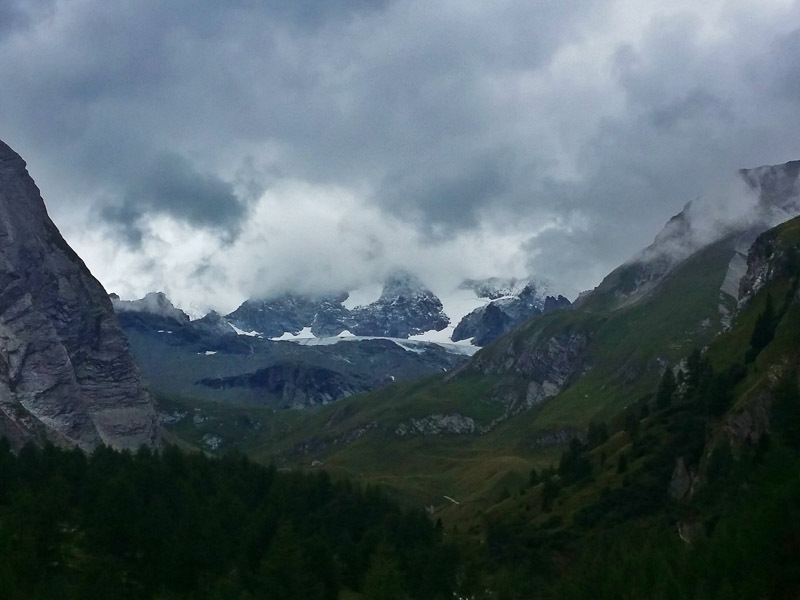 The Grossglockner peaking out, teasing me to come back. While MoaAlm is fabulous for beginners, it’s suitable for all levels. The week after our stay, they had a special Grossglockner expedition, in which guests would learn mountaineering skills and climb the Grossglockner! I SOOOOO want to do this next year! They also have themed weeks. For example, in September, they’re having a special yoga retreat and are planning special weeks just for families. Nelson is an adorable puppy that makes MoaAlm feel incredibly welcoming! Although adventure is a large part of the MoaAlm experience, it’s not the only aspect. Relaxingly active, is how WearActive defines its concept. You can start the day with an energizing yoga session or recharge your batteries after a day in the mountains with a relaxing Yin yoga session, both led by Barbara. I choose the Yin session and felt sooooooo good afterwards! MoaAlm has a maximum of 15 guests. You can relax in your large south-facing room, with far-stretching views into the green valley below, or enjoy the view from the patio which serves as a cafe during the day. There’s also a large lounging space with huge south-facing windows and a great selection of inspiring coffee-table books. Dinner is also a treat. Three-course meals are specially prepared for you with fresh food, locally sourced whenever possible. The chef jokes that the delivery driver always shakes his head at his order, which is different from other chefs in the area. During our stay, we had mushrooms and berries that had been hand-picked earlier that day! I really enjoyed the community dining aspect as well. You really get to know like-minded people from across the planet, resulting in lively discussions! So whether you are a stressed-out corporate type in need of a relaxing active vacation, are a solo traveler wanting to connect with other mountain lovers, or an experienced hiker wanting to up your game in the mountains, you will find it at MoaAlm, in one of the most beautiful settings in all of Europe, with some truly fantastic people! The nearest train station is in Lienz, about 30 minutes away. They will pick you up from there. Notify them of food allergies in advance. I have a gluten allergy which was well accommodated, but given how remote MoaAlm is, the chef needs time to prepare. Check the MoaAlm website for themed weeks or sign up to their newsletter! There are some really cool things coming up! There are no TVs in the rooms – which I saw as a huge plus! You will interact a lot with Barbara, Hubert and the other guests. If you are seeking solace away from people, or time alone with your sweetheart, you may want to choose a more traditional type hotel where you will be left alone. Be prepared to try something new. This is a safe place to do so. Most importantly, have fun! Disclosure: Thank you to MoaAlm for making my trip possible. As always, all opinions are my own. Previous postHow to Cycle the Eurovelo 13 Alone Across Finland! Next postFrank Slide: The Most Unique Hike in the Canadian Rockies! I grew up in Cagliari, Sardinia - say BEAAAAAACH! I guess I get to go to the beach so much when I am home (meaning, from June to October), that when I travel I really don't care for it at all. I look for mountains. I look for that crisp air. The smell of the grass. The clear skies that are of a different shade of blue. It is a lovely retreat and I wish I could spend a few days (weeks!!) in Hohe Taurern National Park too! @Claudia - That makes sense, the beach doesn't have the same meaning of "vacation" as it does to people like myself who are landlocked. I can't recommend Hohe Tauern or MoaAlm enough. I hope you're able to make it there. Oh, I was in Hohe Tauern National Park this summer too! We spent a week in Bramberg am Wildkogel and went up the Krimml Waterfall, loved it too! We went up the Kitzsteinhorn (by cable car) and properly climbed the Wildkogel including the panoramaweg back down. :-) Loved it and want to return. @Jen - I would love to climb the Wildkogel - so much to do in Hohe Tauern. Glad to hear that you enjoyed it! @Izy - I'm sure Nelson would love to meet you too. He's very friendly! I'm going to be doing Europe in the next few months, but my time is limited, because I have to be in Brazil for the Olympics. I need to pick a couple of places to spend extra time in, and others just to breeze through. Austria looks absolutely stunning. Having been all over Europe, would you suggest Austria be one of those places I spend extra time in? @Christian - If you love the outdoors, especially the Alps, then Austria is an excellent choice! Slovenia is also beautiful and isn't far from Austria.